Sheilaa Hite is a spiritual hedonist, a concept which immediately conjures up joy, abundance, inspiration and well-being. I met Sheilaa last year at Readers Studio in New York and, believe me, she exudes all those qualities! She was a keynote speaker, as well as a vendor with a table stocked with her books and Tarot-inspired creations – shawls, jackets, vests, tote bags and Tarot pouches. Sheilaa has recorded a class for Global Spiritual Studies with the intriguing title, Karma, Past Lives and the Tarot. Click here for more information and to purchase the class as a file you can download to your device or receive stored on a DVD or USB flash drive. LINDA: How do you define or explain the concept of karmic connections? SHEILAA: A karmic connection is a connection between two or more people over a period of one or more lifetimes. A karmic connection can exist between people and places, too. Energy never dies; it simply changes form. So when our bodies ‘die,’ our energy, emotions and soul memory live on and when we’re ‘born’ into a new body, those energies, emotions and soul memories from our former existence dwell and express themselves in the new body. When the soul with the new body meets and recognizes a soul or a place from a former lifetime, that soul becomes aware of and is acknowledging that they are in relationship, i.e., karmically connection. LINDA: Is the feeling that someone is our soul mate a particular kind of karmic connection? SHEILAA: Interestingly enough, a soul mate connection doesn’t always involve people! This type of connection is experienced when two entities sense a bond that unites them in some profound, often mysterious way. How many times have you met someone and felt that you’d known them before? That’s called soul recognition which sometimes leads to the realization that you and the other entity are soul mates. Soul mates are here to teach us something or help us in some way. A soul mate can be a person, a pet, a friend, a lover– even an enemy! Many people confuse ‘soul mate’ with a ‘twin flame.’ A twin flame always involves two people who are united by a romantic love that has spanned lifetimes and is a much deeper and more loving connection than a soul mate connection. LINDA: We often talk about ‘fate’ and ‘destiny’ as though they’re the same thing, but is there a difference? SHEILAA: There is a difference between ‘fate’ and ‘destiny.’ Fate is like a contract that your soul has to keep, while destiny is how you go about keeping it. Each soul must accomplish certain achievements that are personal to them and the advancement of their soul, i.e., learning to value themselves or learning selflessness– that is their soul’s mission or fate in this lifetime. Destiny is the path you take to accomplish those soul missions. LINDA: Where does free will fit into the big picture of fate, destiny and karmic connections? SHEILAA: Free will doesn’t mean you don’t have to complete your soul’s mission (fate) if you don’t want to; it means that you get to choose how you’re going to complete it. An example of fate and destiny: You are contractually obligated to leave California and go to New York– that is fate. Destiny is choosing your mode of transportation– plane, train, bus, car or walking, and the route you’re going to take– sleek interstate highway, bumpy country roads or carving your own path out of the wilderness. The choices you make on the way to arriving at your fate are up to you and will determine whether or not you have a pleasant experience or a gnarly one. LINDA: How do you use the Tarot to explore past life or karmic issues? SHEILAA: The cards are pictorial representations of all that we know. The images on them evoke or stimulate a connection to subconscious, previously hidden knowledge or memories. I use the cards in specially designed spreads to help point out and unveil the meaning of a person’s past life to the one they’re living now. If the cards indicate that the person is dealing with a past life/karmic issue, I like to know what the client has to learn and do to balance the energy so that they can lead a joyous, meaningful life and take advantage of the positive aspects of their karma. LINDA: Which cards in particular alert you to karmic connections? 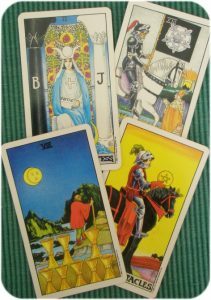 SHEILAA: A few of the cards that alert me to karmic issues and connections are the Major Arcana cards, The High Priestess, The Hanged Man and Death and the Minor Arcana cards, the Three of Wands, the Eight of Cups and the Knight of Pentacles. A full list of the cards that indicate karmic issues can be found in my book, The Infinite Tarot. 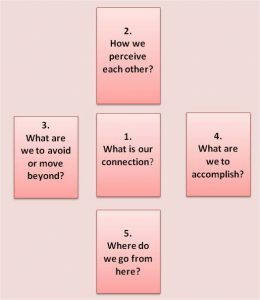 LINDA: You created a layout called ‘Have we met?’ How do clients generally respond to this very direct way of looking at past life relationships? SHEILAA: Clients love looking at their lives through the lens of karmic connections! The ‘Have We Met?’ spread is very popular with them because it helps them better understand the reasons for the people and circumstances they’re dealing with and it gives them useful, practical advice on what to do when they encounter someone they’ve known in a previous life. LINDA: Do you also use astrology to explore past life or karmic connections? SHEILAA: I do use astrology to explore past lives and karmic connections. The horoscope wheel actually has three houses or areas of life that speak directly to the issues of past lives and karma. By examining the planets in those houses and the aspects or relationships they make to other planets, an astrologer can glean a lot of useful information that can be very helpful to a client. LINDA: In summary, why do you think it’s important for us to incorporate karmic and past life issues into our everyday lives? SHEILAA: It’s important for us to be aware of the karmic and past life issues that are at work in our everyday lives because those energies and issues are the subtle but powerful motivating forces that propel us forward, hold us back and/or compel us to behave in ways that aren’t always beneficial to us. The more conscious we are of the reasons behind our thoughts and actions, the more power we have to control the course of our lives. Sheilaa Hite is a world renowned Master Tarot consultant, instructor, Intuitive, author and catalyst of the soul and mind whose unique ability to expertly unite, ignite and interpret the key elements and powers of the Tarot, and develop this gift in others, is legendary. Featured in Paulette Cooper’s book, The 100 Top Psychics and Astrologers in America, she’s a naturally gifted Intuitive with an accuracy rate of 95-100% who guides her clients and students through learning the modern-day alchemy secrets of unravelling the mysteries of life and the Tarot. 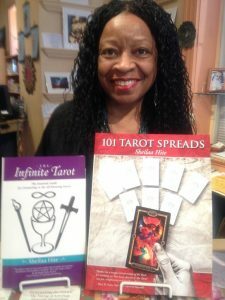 The author of two books on the Tarot – The Infinite Tarot and 101 Tarot Spreads – she’s acknowledged as “original,” “charismatic” and “brilliantly insightful”, as she astutely uses the Tarot, Astrology, Palmistry, Psychometry, Dream and Symbol Interpretation, Mediumship, Channeling, Meditation, Healing and Intuitive Counseling. One of the 21st century’s foremost life-skills mentors, she is also a Certified Clinical Hypnotherapist, Past Life Regressionist, Certified Mentor/Life Coach, Healer, Motivational Speaker and Author. Her international client list numbers in the thousands and includes TV, movie and sports celebrities, politicians, homemakers, business professionals and members of the clergy and military. Her articles and columns have also appeared on-line, as well as in numerous national and international publications. Through her company, Odysseys – Grand Travel Experiences for the Heart, Spirit, Body and Mind, she also conducts tours and leads retreats to inspiring, beautiful places throughout the world. For more information visit Sheilaa’s website. How have you experienced karmic connections? Have you ever used Tarot or astrology to explore karmic connections? If so, did you find the process illuminating? We’d love to hear from you!